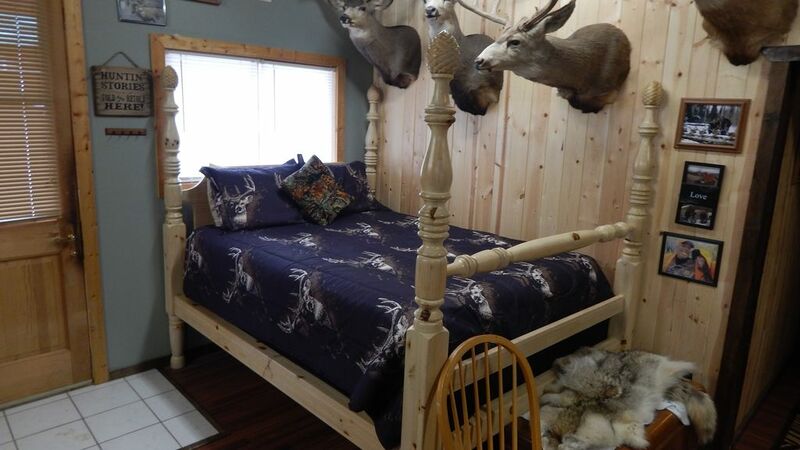 The Hunter's Lair is a 3 bed cabin consisting of 2 queen beds, 1 in a private room, 1 queen, 1 twin bed with a roll away available upon request in great room. Has a well stocked kitchen with fullsize fridge and outdoor barbecue grill or within easy walking distance to local restaurants. Also has wireless internet and satellite TV. Hospitality and service is our number one goal scoring 5 out of 5 stars. Nicest, best value family lodging in Crawford. The Lair has a fullsize leather couch with matching love seat with recliners, very comfortable and homey. Please check out our Trip Advisor reviews, get away from the big city and come relax in one of Colorado's hidden gems The Hunter's Lair. The lair has an evaporative cooler that works well and two fans located in each room. The Lair has a electric fireplace and baseboard heat. Covered smoking area outside, 420 friendly. Thanks Lisa, we were glad to have you and look forward to your next visit, Gary says hello and is looking forward to taking you out fishing. Thanks for your great review of the Lair, we strive hard to make sure our guests leave as friends and are always welcome back. My wife and I enjoyed our stay in Crawford. Tammy and Gary were very friendly, as were the other folks in town. I only had 2 issues, which were more related to VRBO than the property itself. First, the description of the property on the website specifically says there is a queen bed in a private room, plus another queen bed, twin bed, and couch in the big room. The entire property was only that big room with the queen bed, twin bed, and couch. There was no separate room with the 2nd queen bed as the website stated. It wasn't that big a deal for us, since it was just my wife and I, but the website description should really be more specific. If we were traveling with our kids, we would have been pretty upset to find there was no separate bedroom. Second, there was no mention on the website about separate charges for pets. We called VRBO to book the room, and specifically told them we were bringing our 3 dogs. They told us the price, and booked the room for us for 6 nights. Then after we had already spent 3 nights in Crawford, we were informed that there is an additional charge of $12 per dog per night. To Tammy and Gary's credit, they didn't charge us the full $216.00, and agreed to charge us a flat $100.00 taken out of our deposit. So while we didn't end up paying the full pet surcharge, we still ended up paying more than we had agreed to, because that charge was not disclosed up front. I have no problem with there being a surcharge for pets, but it really needs to be clarified on the website, or at the very least disclosed when making the booking, so that the customer can make an informed decision knowing the FULL price before booking the property. We have booked several vacations using VRBO, and this is the first time we've had these surprises. All in all, we had a very nice time. Thank you Tammy and Gary for everything. What a fun cabin-very deer camp reminiscent! Gary & Tammy were very friendly & helpful when we arrived. The cabin was very clean with everything we needed for our night there. It was fun to see all the pictures & creatures Gary has caught on the walls. We were right in the quiet little town with it’s neighbors passing by. Tammy and Gary were more than accommodating. Between suggestions for places to enjoy my visit to Colorado and making sure that I had everything I need at the lair, they were very hospitable. I would gladly stay again. The town of Crawford was nice and is a nice location if you’re looking to enjoy the outdoors.